At the Greenslopes Bowls Club last Sunday, Pushies Galore covered every square inch of the bowling green. 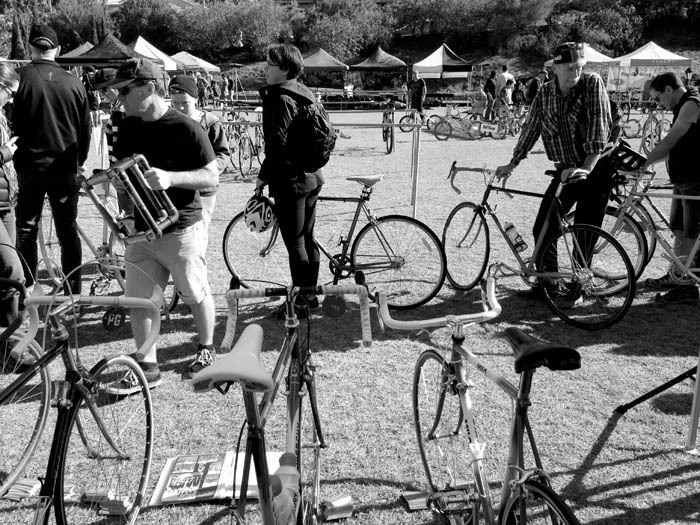 Spilling out from the edge of the green and into the car park was the bicycle swap meet. Anything and everything was on offer, I found a pair of mint Campagnolo C Record pedals for my Bianchi X4 build and an as new retro 80's wool jersey, one swapped for cash and the jersey traded for old bike parts. Inside the club house there was tea and scones, or you could buy a beer at the bar. This year Studio Sixty ran a photo booth for all the entrants into the show 'n shine competition. All you had to do was rock up and Jason Starr was there to take your picture with your bike. There was an Instagram #tag service, anyone using the #pushiesgalore tag had their picture immediately printed out for free to take home or plastered on a display board. Another successful year organised by the hard working Pushies Galore team headed by Gavin Bannerman and Richard Butler. The sun was out on a glorious Brisbane winter's day, bonus. 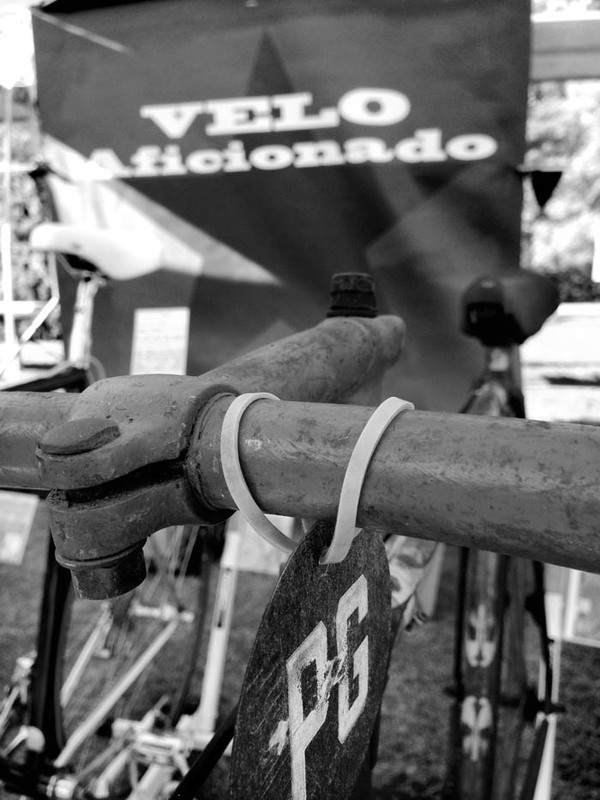 For the first year running we had a stand on the green, displaying bikes from four of the posts that we've featured on Velo Aficionado throughout the year. There was Matt Leasegang's Milo bike, he'd just completed the build the Wednesday before Pushies Galore. After eighteen months wearing out his fingertips on the keyboard searching for parts and grilling his mates for information on every detail of the build, Matt's Milo bike is a real winner. 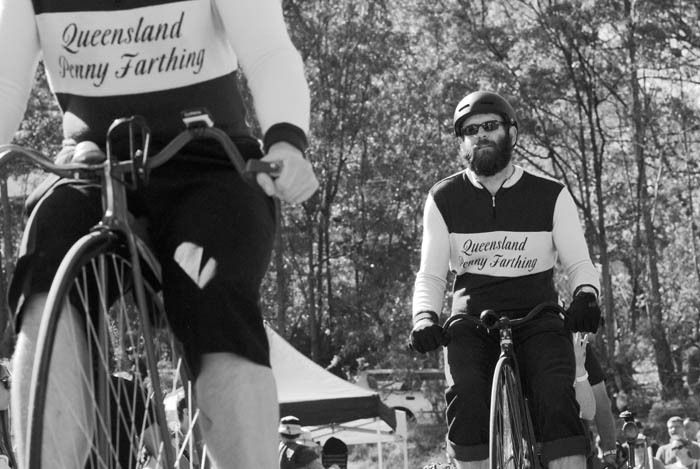 To boot Murray Donald, who used to race on the bike back in the mid 80's when it belonged to the Queensland Cycling Association, brought along an original Milo skin suit that the Queensland riders used in national teams time trial competitions. Ben Smith's Motorola MX Leader Eddy Merckx was all polished up and sat next his ICS - Ital Cicli Systems Design - Zurich, gold plated Campagnolo modified, C - Record show winning machine. Ben's ICS won best in show for road racing bicycles in the Pushies Galore show 'n shine. The fourth bike we had on display was Michael Glancy's Arrow 1930's track bike, with original pin lined paint job. Also on display over in the clubhouse were Joe Cosgrove's bicycle frame painting stencils that we'd featured in a post on bicycle frame painting techniques of the early 20th century. Out on the green there were plenty of interesting bikes to keep you occupied, there seemed to be more BMX bikes than ever. 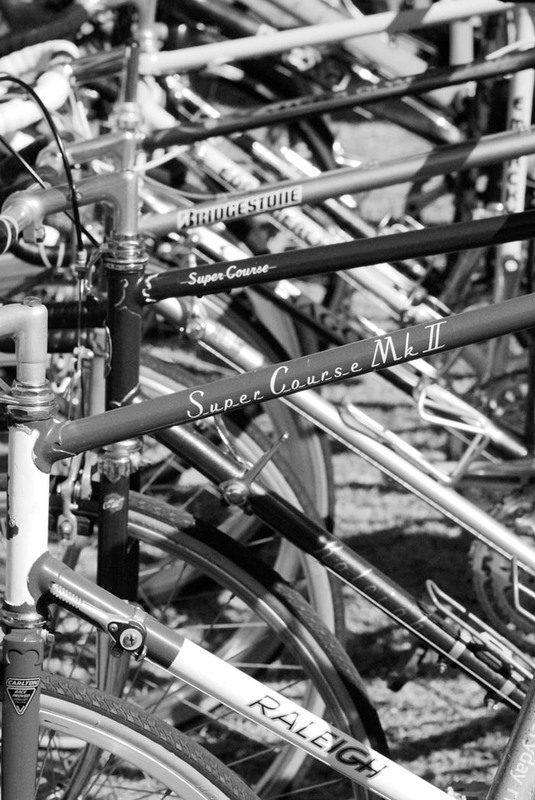 A couple of standouts were a Malvern Star that the creator had obviously enjoyed building, it had parts from a few different eras, carefully blended together for a very slick retro vintage bike look, ready for L'Eroica styled events. Obvious joy was taken in drilling and pantographing the machine in true retro fashion. The best thing about putting together a machine like this is you can do what you want, rather than being bound by a restoration project and trying to finesse every fine detail of seemingly unobtainable parts. Sitting next to the Malvern Star was a Motorola Eddy Merckx team bike belonging to Dan from Shifter Bikes, this particular Motorola was one that Phil Anderson had raced on in the early 90's, the real deal. The other standout in the road bike department was a Look Ferrari road bike, which apparently had been detailed and painted in Australia by the importer of Look bikes. 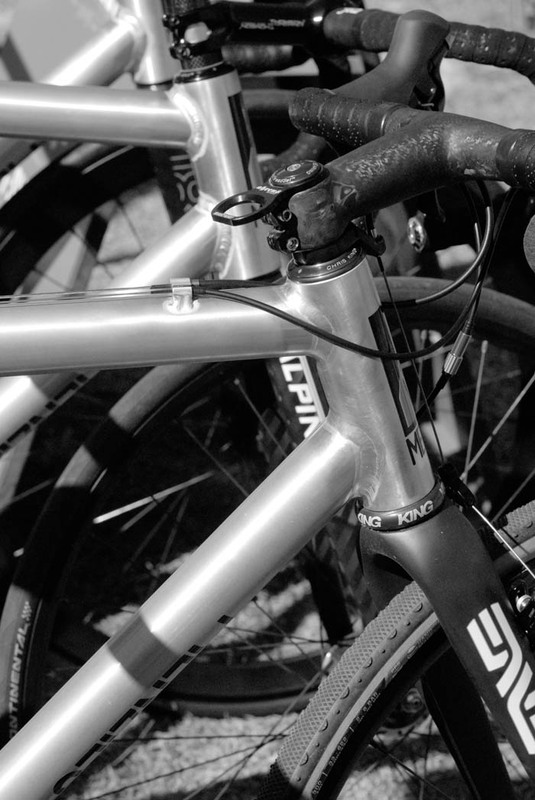 A couple of new bike frame builders slipped quietly into the fray. Brad Marshall's Loose Goose, an example of experimental concepts in design and innovation. Brad's been busy the last couple of years re-purposing frames and giving them a new lease of life, while putting his own unique touch into their final form. Not afraid of stripping frames and components apart, then sourcing processes and new components from all around the globe, Brad's bikes are ones to watch for the future. His custom head badge for the Loose Goose came out of Scandinavia, Brad stripped an old steel frame and referenced 1980's funny bikes for his final "winged" design, complete with a paint job reminiscent of the Cinelli Laser. Slotted in next to the three established frame builders, were the offerings from new kid on the block, Adrian Knowles. Adrian's soft launch of his brand spanking new Menzie's Cycles brand went quietly. Custom built by ex Kenevans builder, Mal McPherson, Adrian's Menzies Cycles are another one to watch. Adrian's been busy schooling himself in carbon fibre construction and frame building techniques. Not one to do things in half measures you'd think Adrian was a thirty year veteran of the industry, listening to him speak about bicycles and design. Adrian's Ti dirt road rider on display had a set of custom one piece carbon bars and stem that he'd recently completed. Frame builders Keith Marshall - Kumo, Ewen Gellie - Gellie Custom Bike Frames and Darrell Llewellyn McCulloch were set up right next to Menzies Cycles. Joe Cosgrove from Cycle Design was there showing off some of his latest custom paint jobs. 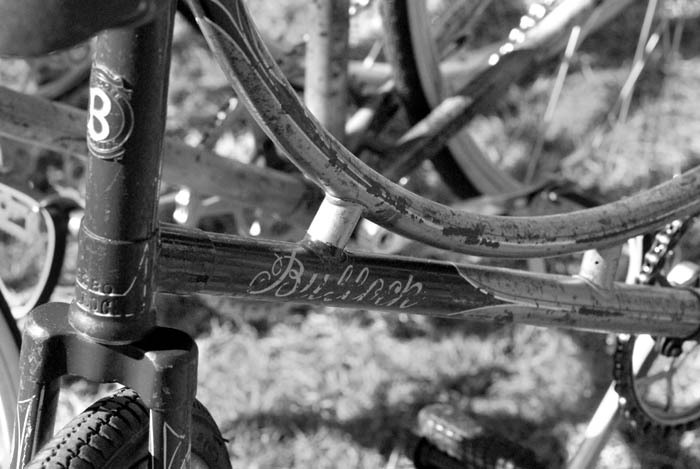 Alongside Joe was Michael Glancy from Brisbane Vintage Bicycles with a whole slew of old bikes frames for sale. Over in the tea room were three bikes that had completed Lyle Paull's shearer bike run for 2014 , earlier in the year Lyle had written in to Velo Aficionado saying "I am the owner of the “shearers bicycle” that was at Pushies Galore. About 12 of us will be riding 100 year old bicycles from Broken Hill to Bourke along the Darling River dirt tracks (600klms) in may 2014. I hope to make an annual event." Lyle. There was a version of a shearer's bicycle, another old bicycle and an early BSA track bike, all of these had completed the Darling River dirt track ride this year. The BSA track bike was of particular note because the owner had restored the machine locally. While restoring the paint job a local Brisbane pin liner was contracted to do the job. Pin lining was a very specialised area of bicycle finishing, expert pin liners worked their way up from apprentice level to skilled master. So when the owner of the BSA tracked down his man, the job was completed freehand. The pin liner hadn't worked for years but took to it like he'd never forgotten a thing. One of the tools of trade used for that job was a special pin lining brush, cut with a "forward vee" for finesse when lining frames freehand. Freehand pin lining was a skill unique to our Brisbane pin liner, some preferring to use a guide to steady their hand. The retired pin liner also had his own unique lining style, so while restoring the BSA he completed it in the style he was renowned for. Telling his new customer that every pin liner had their own identifiable signature style. If you knew the style you'd know who had pin lined and finished the bike. Today, an almost lost and forgotten art. Out on the green again and the bicycle parade was on. This year were a couple of retro army bikes, complete with riders decked out in period military uniforms. A couple of laps around the green as kiddies and penny farthings flashed by. As the afternoon rolled on the show 'n shine was run and won, then like a flash the whole show evaporated and was spirited off into waiting cars. The mass exodus from the green at Holland Park Bowls Club signified the close of another successful year at Pushies Galore 2014. Ben Smith's ICS Ital Cicli Systems Design Zurich gold bike, won best in show at Pushies Galore in the road bike category. Matt Leasegang's Milo bike that Murray Donald had raced on in 1986, Matt restored the bike and Murray was there to see it for the first time since 1986. Studio Sixty had a photo booth running for anyone with a bike entered into the show at Pushies Galore. Matt Leasegang, happy after 18 months of banging the keys searching ebay and harassing his mates for info and gear for the Milo bike. The queue grew long at the bike photo booth at Pushies Galore. Brad Marshall's Loose Goose bike. Custom Loose Goose head badge by Brad Marshall. Brad Marshall played with 80's funny bike design with his 2014 Loose Goose, they were experimental then, Brad's dragged the concept out of cycling's skeleton closet of horrors. Matt Leasegang left checking over his Milo resto with original rider of the machine, Murray Donald. Murray Donald brought along an original skin suit that he'd raced in during 1986 on the Milo bike in international team time trial competitions. 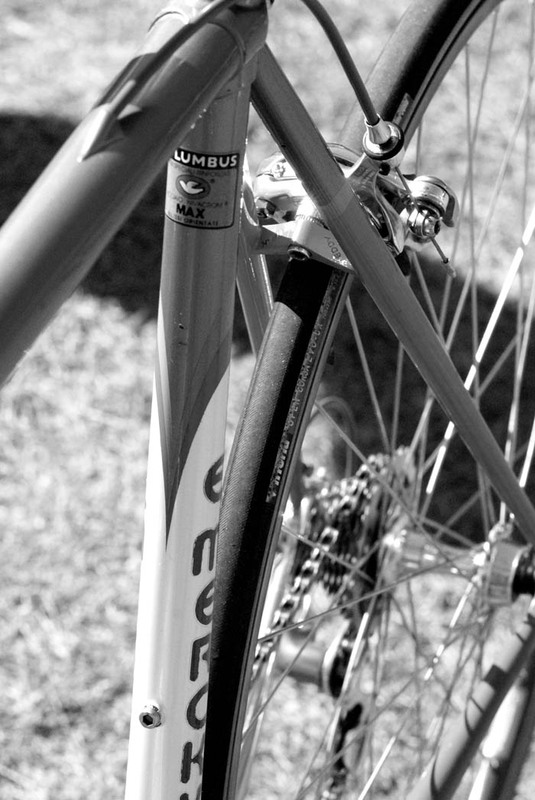 The joy bicycles can bring, Murray advised Matt Leasegang on every small detail on the Milo build. Both restorer and ex-racer thrilled with the result. 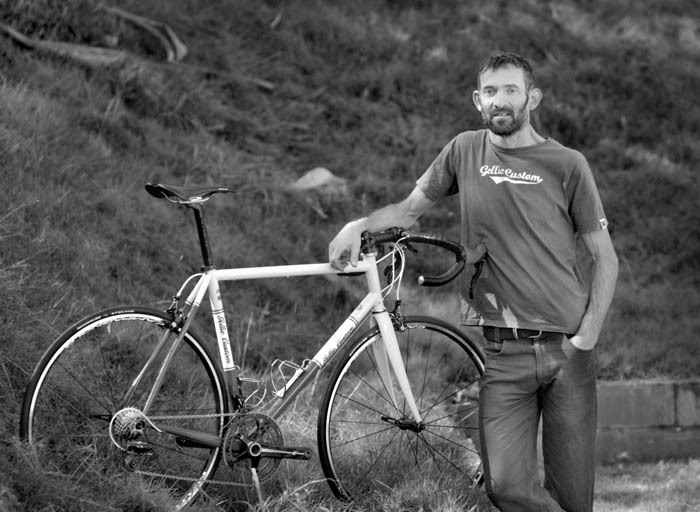 Bike painter Joe Cosgrove from Cycle Design talks to bike collector Ben Smith. Th Pushies Galore swap meet filled the car park and swelled out along the edge of the bowling green. Then Dan from Shifter Bikes rocked up with his Motorola Eddy Merckx MX Leader that Phil Anderson raced on. BSA track bike, re-painted and hand pin lined by a local Brisbane pin liner. The owner had to get the pin liner to come out of retirement for the job. The BSA and this Shearer's Bicycle were ridden on a long inland trek this year, the same type of run that early Australian bike riding shearer's would have made. The other bike that accompanied the shearer's bike and the BSA on the long trek. Pushies Galore 2014 plenty of bike action on the bowling green. 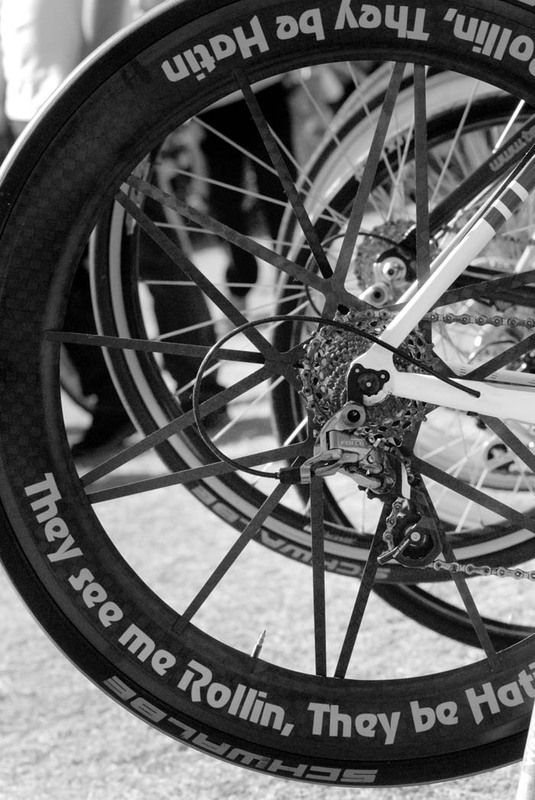 The debut of Menzies Cycles by Adrian Knowles, ushered in quietly at 2014 Pushies Galore. Menzies Cycles dirt road rider by Adrian Knowles, in house constructed one piece bar and stem. 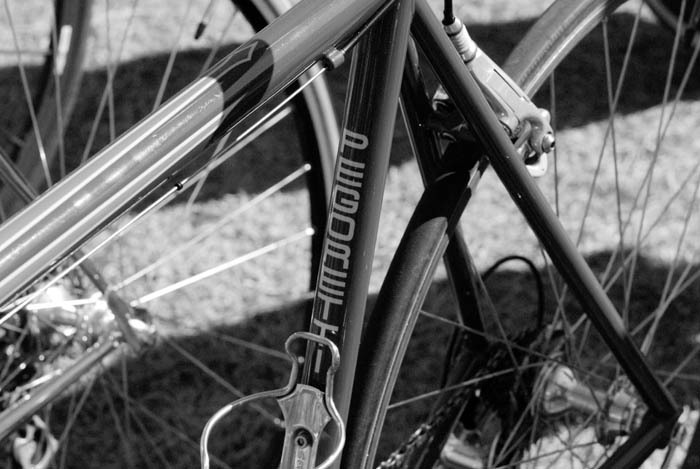 Everywhere you look, Adrian Knowles has been there, here's his Pegoretti. Chunky Cinelli stem mated to 3ttt forma SL handlebars. The BMX bike section was invading the bowling green this year. A couple of fully kitted out soldiers on vintage military bikes were riding about the bowling green at Pushies Galore. Military bike close up before the bicycle parade at Pushies Galore. The military bikes were entered into the parade and did a couple of laps around the bowling green. The military bicycles stole the show with riders in full uniform. Military bike in action on the green. 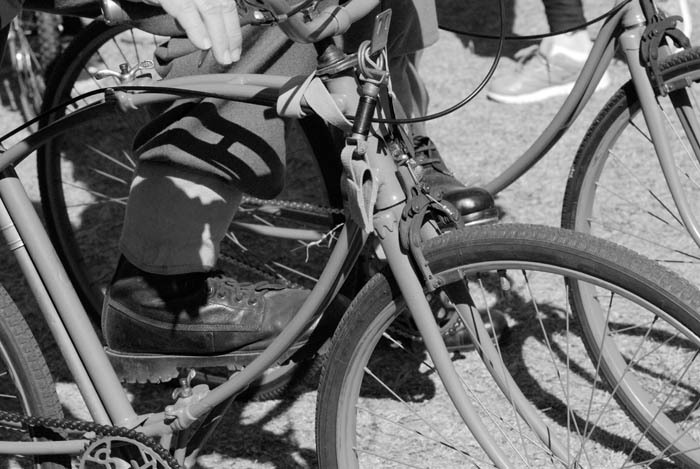 Military bikes, the original portable travel bike, this one has wing nuts at the junctions. Look Ferrari bike special version customised paint by the Australian importer. Carbon in the pink, the paint was pink. Malvern Star play bike, this one had bits from all over the shop, nicely put together in one homogenous stylised project, complete with "drillium ad nauseam." The drillium ad nauseam Malvern Star included plenty of neat pantographing. Drillium ad nauseam waaay back to the 70's although this looks a bit neater than some original workshop attempts that I remember completing myself back then. Phil Anderson's Eddy Merckx Motorola MX Leader team bike, on display at Pushies Galore by Dan from Shifter Bikes. Team Issue Eddy Merckx Motorola MX Leader, Phil Anderson once raced this machine. Motorola team bike, the genuine article. Ben Smith with Gavin Bannerman of Pushies Galore and the show winning "Road Bike of The Year", Ben's ICS Ital Cicli Systems Zurich - Campagnolo C Record Gold Plated "Carriage Market Bike". 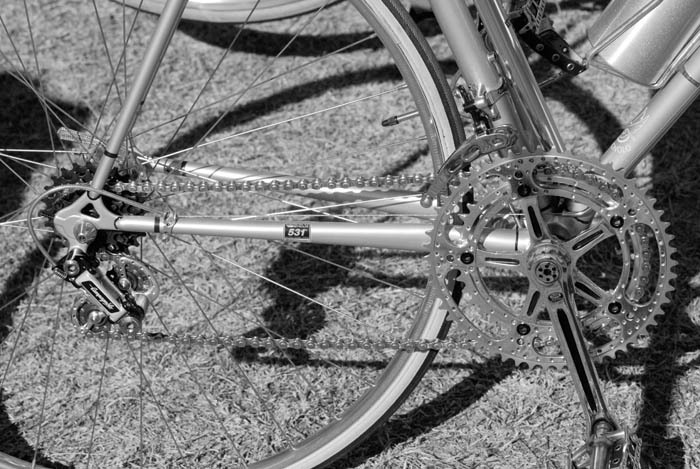 ICS Ital Cicli Systems Design Zurich Bike, the winner. A Ewen Gellie custom road bike. Detail Ewen Gellie Customs Bike. 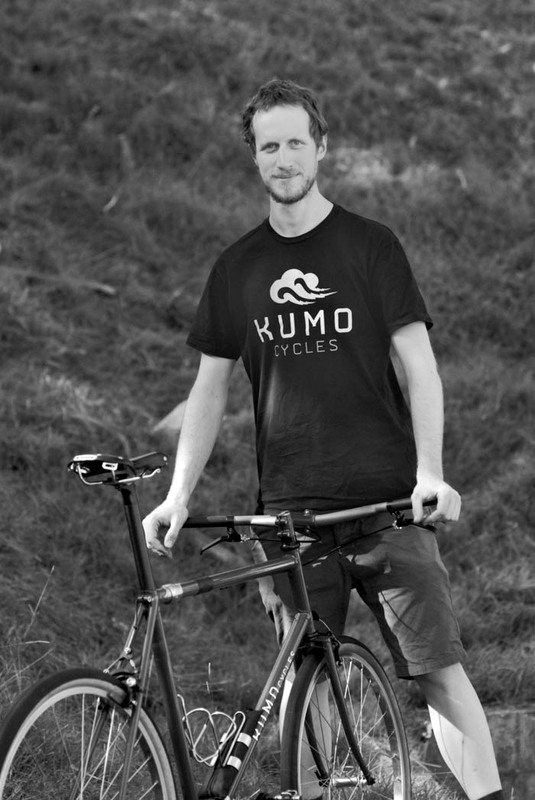 Keith Marshall Kumo frame builder with his fold up travel bike. Joe Cosgrove Cycle Design frame painter.